Make your tub or shower look new again! As your #1-bathroom refinishing specialists, The Bathtub Medic Fresno has the experience needed to provide you with the highest quality services and we back our bathtub and shower refinishing jobs with a written five year warranty. Have a bathtub / countertop chip or crack that needs to be repaired? Don’t try to fix this yourself, call the professionals and have it done right the first time, saving you time and frustration! The Bathtub Medic Fresno has a team of experienced specialists who can provide you with bathtub chip, cracked countertop repair, resurfacing & tile steam cleaning in Fresno, CA. 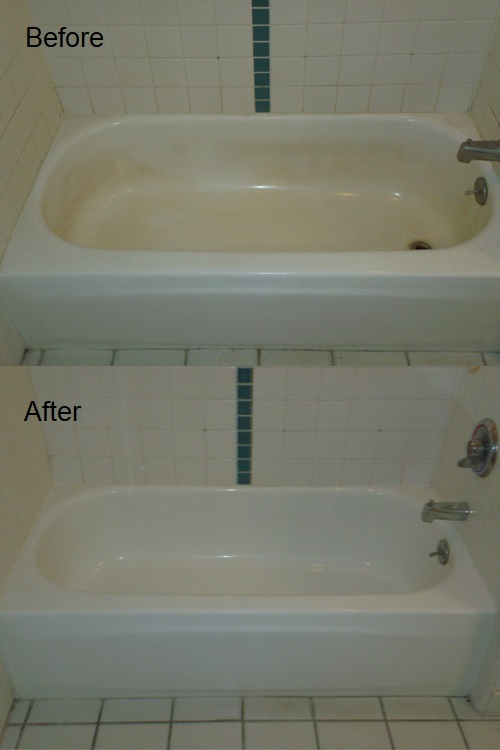 If your bathtub or shower is looking worn and tired, call us and we’ll make it shiny and attractive again. You’ll be amazed at how great we can make your fixtures look, all done in the course of a day or two. And this is a process that will save you thousands of dollars over the price of gutting the bathroom to replace the tub. The Bathtub Medic Fresno knows that repairing a chip or crack in your tub isn’t as simple as filling and sealing. These repairs need to be professionally done so that in a weeks’ time, your tub isn’t leaking all over your bathroom and causing even larger problems. The bathtub chip & crack repair services in Fresno, CA that we offer are always performed by experienced and fully trained workmen who take pride in their job. We care for your home as if it was our own! Bathtub resurfacing can make your tub look brand new after it has been damaged, saving money when compared to the cost of replacing the entire unit. 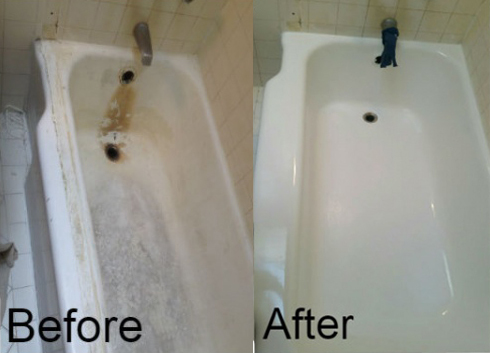 The Bathtub Medic Fresno offers bathtub resurfacing services in Fresno, CA to refresh your tub, repairing damaged areas and refinishing the tub’s surface. This is a common service offered when remodeling your bathroom and the tub does not need a complete replacement. Mineral buildup & soap scum are common issues found in the everyday bathroom, but not ones that should stay there. The Bathtub Medic Fresno uses steam measuring over 300 degrees to remove years of buildup, saving you hundreds of dollars and the hassle of having to replace your bathroom tiles. Whether your tiles are fiberglass or porcelain, our bathroom tile steam cleaning services in CA can leave your tiles looking brand new. For professional bathtub chip / crack repair, tub resurfacing and bathroom tile steam cleaning services in Fresno, CA, call the experienced team at The Bathtub Medic Fresno. My experiences with Wayne and his crew were consistently attentive to any of my questions/concerns, and very professional. Now that my tub refinish is complete, I am very pleased with the beautiful result . The two men who worked on the project were very competent and cleaned up meticulously at the end of their work days. If I had another tub, I wouldn’t hesitate to call The Bathtub Medic. Thanks. Why Should I Choose The Bathtub Medic? Smoother Finish- The Bathtub Medic takes the extra time to sand and polish every square inch of the refinished tub, leaving a finished coating that is both more attractive and easier to keep clean. Meticulous Preparation- Our process involves half a day just to prepare the bathtub for the refinishing process. We painstakingly clean the tub and remove the old caulking, then pull out the drain and repair all chips in the tub surface. In many cases we fill and sand the entire floor of the tub, so that all chips and rough spots will be smoothed out. And of course, we carefully mask and protect the bathroom floor, walls, and fixtures. Durability- The Bathtub Medic uses the highest quality refinishing primer on the market: a primer that adheres to porcelain whether the surface is smooth or rough. This has two advantages: our coatings adhere better and last longer, and we avoid the old process of etching the existing porcelain with acids (as done by many other refinishers). You won't have to worry about toxic acids damaging your floor, tile, or plumbing. Experience- The owner of The Bathtub Medic has personally refinished and repaired more than 5,000 bathtubs over the last 28 +years, making him among the most experienced refinishers in the California. Price- As an independent, family-owned business without royalties to pay, The Bathtub Medic has a lower overhead and offers competitive prices. Free Dinner Offer- The Bathtub Medic offers a $50 dinner gift certificate to all residential customers who refer us to a new customer for a full tub refinishing job within 30 days of the completion of work. Mustache- Of course, the most important reason to hire The Bathtub Medic is simply because he has that magnificent, world famous mustache.